Fatah is moderate? Member of PA chairman's group calls for violence instead of "futile negotiations". The West continuously says that Palestinian Authority (PA) chairman Mahmoud Abbas’s Fatah faction is “moderate” and a “peace partner” for Israel, as opposed to its rival Hamas whose constitution calls for Israel’s destruction. However, a video released by the Middle East Media Research Institute (MEMRI) proves yet again that Fatah is just as willing as Hamas to resort to violence against Israel. 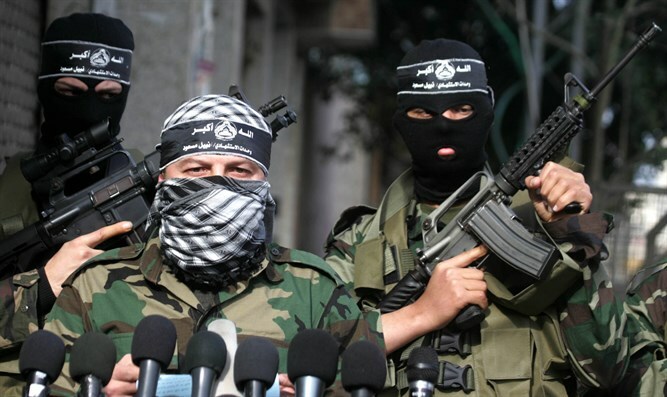 The video shows Abu Ahmad, a commander of the Nidal Al-'Amoudi Battalion of Fatah’s Al-Aqsa Martyrs' Brigades in Gaza. In it, he says that Fatah "went astray when it laid down its weapons in those bygone times – when it entered the Oslo Accords" and adds that "as long as Fatah and the national enterprise are alive, Palestine must be liberated through the might of its fighters, and not through futile negotiations." The comments were made on December 31 on Alkofiya TV, a Palestinian Arab channel affiliated with Muhammad Dahlan, Abbas’s longtime political rival who some view as his successor. “Fatah is a liberation movement, not [just] a ruling political party. It will constitute a vigorous revolution as long as the occupation weighs heavily on our lands. We shall never lay down our weapons, no matter how many conspire against us. We shall remain loyal to the legacy of the martyrs. Rest assured, my brother, that as long as Fatah and the national enterprise are alive, Palestine must be liberated through the might of its fighters, and not through futile negotiations here or there,” said Abu Ahmad. The video is just the latest in a series of similar calls to terror that have been exposed in recent years. While Abbas tells the West in English that he is against violence and terrorism, his television channels and social media pages belonging to Fatah openly call for terrorism against Israelis.